The Placements importer can be used to bulk-import any number of Placements at once. Each Placement would be imported on its own row, meaning that the information for each Placement can differ. The only information that cannot be included in its own column is a planned assessment(s) or survey(s). Please note, however, that you may create this information ahead of time in a template and reference the template in the import. Importing was limiting in the past because you could not enter planned assessments or surveys. 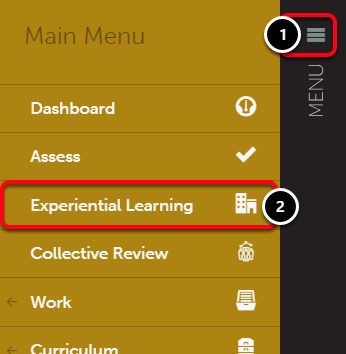 Now that users can reference a template for each Placement that they import, the template's planned assessments and surveys will be applied to the imported Placement with which the template is associated. Why not just use templates? They can be limiting, too. Templates do not allow for the completion of ALL information since it will be used to create multiple, unique Placements. Fields like location and start/end dates had to be entered after the Placements were already creating, costing you time. It is recommended that you use a combination of templates and importing. Use the Placements Templates feature to create planned assessments or surveys for Placements, but use the importer to import each individual placement. This will prevent the Administrator from having to access each Placement individually to enter any specific information. Prior to importing a Placement, we recommend that you gather all necessary data in a file outside of Chalk & Wire (Excel or CSV). Are You Using an Excel Spreadsheet to Compile your Placements? Ensure that your spreadsheet cells are formatted as text. If they are not, certain values (dates, NCES IDs, zip codes, etc.) will be altered and made invalid for our importer. How do I Format Cells as Text? Use the Format menu option in Excel to select Cells. Next, select Text in the Category column. Placement Name: Required, but may be omitted in the rows. A label given to the placement. If omitted, the importer will use the Default Placement Name set above. Start Date: The date the placement begins/began. Accepts multiple formats e.g. 2015-01-01 or Jan 1. End Date: The date the placement ends/ended. Accepts multiple formats e.g. 2015-01-01 or Jan 1. Subject: The subject matter that relates to this placement. Grade/Level: The grade or level that is associated with the placement. Notes: General notes about the placement. Length (hrs): The duration of the placement in hours. Candidate: An identifier for the candidate. Full name, email address, student # or Chalk & Wire user ID. Stakeholder: An identifier for the stakeholder such as full name or email address. The person must already exist in the system as a user or guest to be matched. Department/Group: Required for users with Administrator Override(s). The department or group to which the placement belongs. Application Start Date: If candidate application is involved, the opening date for receiving applications. Application End Date: If candidate application is involved, the closing date for receiving applications. Location Name: Name of the location at which the placement took place. Location NCES ID: A unique number assigned by the National Center for Education Statistic to US public schools. 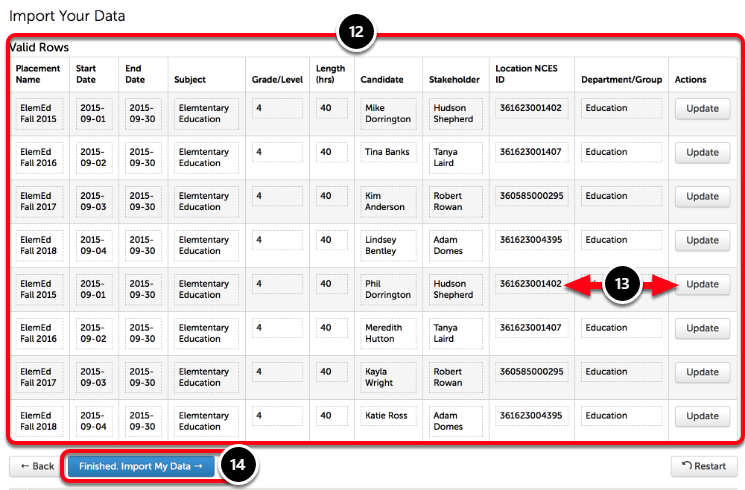 You needn't specify any other location information when using the NCES ID column. Location Street Address: The location's street number and name. You must also specify the City, State/Province, and Zip columns when using Street Address column. Location Zip: The location's Zip or Postal Code. You must also specify the Street Address, City, and State/Province columns when using the Zip column. Location State/Province: The location's Sate or Province. You must also specify the Street Address, City, and Zip columns when using the State/Province column. Tags: Any tags that you would like to apply to the Placement for categorization. The tag must already exist in Chalk & Wire. Custom Fields: A response to a Custom Field that already exists in Chalk & Wire. NEW! Template: Name of an existing template to be used in creating the placement. Any desired fields that are not included in the template should be imported in separate column(s). 3. Click on the Import Placements button. 4. Optionally enter a Default Placement Name. This name will be provided to all imported Placements. If you would like to enter different names for each placement, please include this information in your import file. A name in the import will override the default. 5. Select how you would like to handle Errors and Warnings. If one or more of your import rows contains an Error, you can choose for the system to skip importing the row or cancel the entire import. 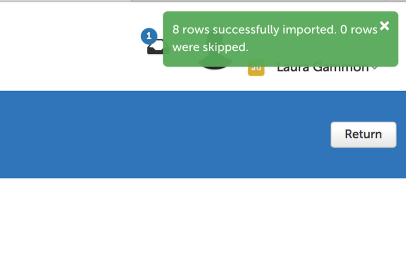 If one or more of your import rows contains a Warning, you can choose for the system to skip importing the row, or import the row but exclude the invalid data. 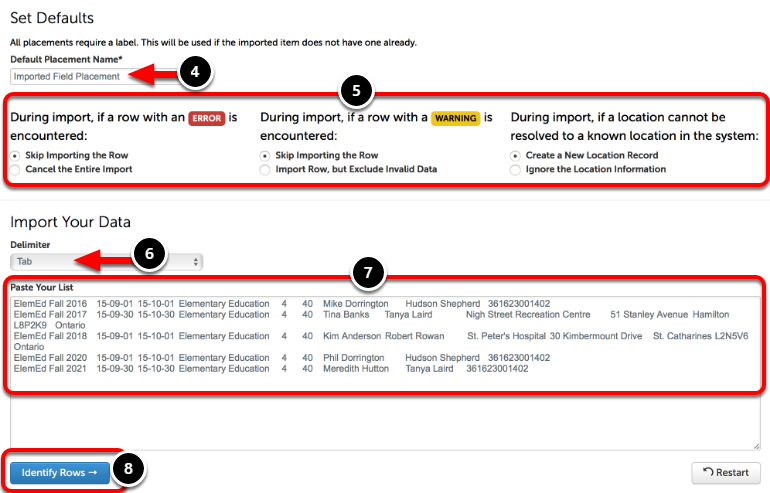 If a Location cannot be resolved to a known location in the system, you can choose to create a new location record or to ignore the information. 6. Select your Delimiter. If you are copying and pasting your content from an Excel spreadsheet, select tab. 7. Paste your import file's content into the importer. If you included headings in your import file, do NOT include them when copying/pasting into the importer. You will define your columns in the next step of this process. 9. Use each column's drop-down menu to identify the column. This will tell the importer where to include each piece of information in the importer. 10. If you have included a Stakeholder in your import, you will need to enter a label for the Stakeholder before you can continue. You can use any labels you would like for your stakeholders. NOTE: If you have added stakeholders to a template that you have identified in your import content, you will want to ensure that the stakeholders are listed in the same order (both in the template and in your import content) so that they receive the appropriate planned assessments and surveys. Also, if you wish to add additional stakeholders when importing the placement (not included in the template), list them last (after the stakeholders that are already included in the template). If you selected a template(s) to apply to the Placement(s) but also included duplicate information in a separate column, the information from the separate column will override the information within the template. Example: If you enter a "Placement Name" in a column, but the placement name is already entered in the template that you are using, the name in the separate column will be used. Furthermore, if you have added stakeholders to a template that you have identified in your import content, you will want to ensure that the stakeholders are listed in the same order (both in the template and in your import content) so that they receive the appropriate planned assessments and surveys. Also, if you wish to add additional stakeholders when importing the placement (not included in the template), list them last (after the stakeholders that are already included in the template). 12. All valid rows will appear in a table. If you have any warnings, the affected rows will appear in a separate table and provide you with the option to rectify the issue(s). 13. All cells in the tables are editable. If you wish to make changes, click on the cell and edit it, and then click Update. 14. Click Finished. Import My Data. A confirmation message will appear in green to indicate that your import was successful. If you wish to add any application forms, journals, surveys or assessments, you will need to Search for the Placement and edit it.